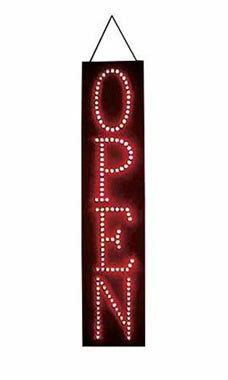 The Vertical LED Open Signs are lightweight and easy to hang from any window in your store. This sign guides customers to your business and is bright enough to see in broad daylight. The sign offers several lighting options and combinations to switch from. This specific sign is 20”W x 7.5”H and plugs into an ordinary 110v receptacle. Additional Information: Power Consumption : 3.5W, Bulb Lifespan : 30,000 hours, 6ft Power Cord, Weight : 2lbs. Works great, but buttons stick. Should come with suction cup. Very pleased with this product. it is exactly what we were looking for and although shipping was high we love this item. Great Service. Sign works really good. The open sign was the biggest hit for our Souvenir building the shining lights attracted fans to our building.